Bouchercon vs. Left Coast Crime: What's in a Name? A jovial comparison between two of the world’s top mystery conventions. What’s in a name? That’s my question for the day. Contrary to popular belief, you can actually start to judge a book by it’s cover, and the name plays a prominent role. Earlier this year I attended Left Coast Crime, the western United States’ premier author and fan convention for crime, mystery, and thriller books. In autumn I made my way east to Bouchercon, the biggest mystery convention in America. First, what’s a Boucher and why is it so important that it has it’s own con? Boucher was a who, not a what. Anthony Boucher helped found the Mystery Writers of America, founded widely read genre magazines, wrote book reviews for the New York Times, and penned seven of his own novels. The man helped raise respect for genre fiction, and so has been rightly honored by the community. If you’ve ever seen “Anthony Award Winning Novel” on a book you’ve read, that’s him too. Usually when someone shortens “United States of America” to “America” I begin to wonder what brand of jingoistic rhetoric will follow. What makes the U.S. inherently more important than Canada or Mexico? They both reside in North America, in the very same continent. Both have relatively large areas. Each has a unique and rich history. Then there’s Central and South American countries to consider. So I apologize for using the concatenation to America (when I say the festival is the biggest mystery convention in America), but it is apt. The Bouchercon festival is big. They completely book out not one, but two high rise hotels. Not just the rooms for attendees, but also all the conference rooms for panels, lectures, and awards. Like Jack Reacher, the famed ex-military police hero of author Lee Child’s best-seller thriller series, both these conventions land in a new city each year, with a new cast of characters driving the plot, and novel problems and adventures to navigate. Nonetheless, in “America” there’s enough space for these conventions to never come into direct conflict. Bouchercon actually claims to be “THE world mystery convention”, but I thought that sounded hyperbolic. To be fair, the convention periodically lands in Canada, and has twice been held in England. Regardless of their respective claims, the conventions smartly choose to be “frenemies”. They occur in different seasons and avoid being in the same region. You stay in your city, I’ll stay in mine, and we’ll have no problems, okay buddy? George Strait’s vision of ocean front property in Arizona. But Phoenix is essentially LA without the water, so I won’t quibble. Crime is clear, even if it doesn’t cover all the genres represented. I’m dubious of the first word, “Left”. I’m a globally minded individual. I’ve lived in countries other than the land of my birth. The points of view of another country’s citizenry differ greatly from those of your own countrymen (and women). Many “Americans” so annoyingly call the USA “the best country on earth”. Hubris I say. France has a deep and rich history that cannot be ignored. The term lingua franca, used by English speakers I might add, roughly translates to “the common tongue”, the bridge language utilized by different groups to effectively communicate. I also lived for several years in Southeast Asia, in Singapore. The 15th century Sultanate of Johor, which encompassed the island of Singapore, was a beacon of modernity when Europeans rarely bathed and medical care meant being bled by a barber. I say all this for perspective. For point of view. Reference point matters. 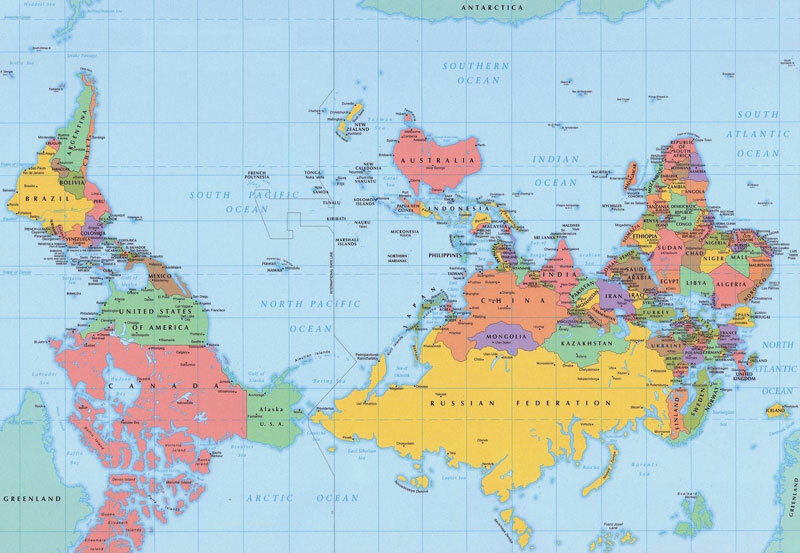 Look at a map of the world. Go ahead. Find one on the internet. If it was fabricated by someone in the USA, you’ll find north America squarely in the middle. The north pole will be at the top of the map. This is why Left Coast Crime is Left. Left of what? Left of east, of course. The Californians needed a catchy phrase to let people know they were just as culturally relevant as easterners in New York, Boston, and Washington D.C. To be honest, I think a lot of New Yorkers would say theirs is the best city in the world, but that’s a fight for another day. Imagine that you are Australian. Perhaps you don’t have to imagine, if you, fine reader, are an Aussie. Everyone else has to engage their gray matter. Put yourself down in Sydney, down under as they say. Then ask yourself, “Under what?” Bring up a vision of that map in your mind, or just look on your computer screen. I’ll wait… Australia is down under that big red horizontal line that divides the map in two. You already had the equator in your head before I had you look at the map, didn’t you? Alright, I’ll speed along. So we come back to reference frame. As the earth goes around the sun in an ever-so-slightly elliptical orbit, it spins on an axis that roughly goes through the north pole and south pole. So up and down make sense when we’re talking about the poles. To be accurate we’d have to take into account an offset between the axis and the magnetic poles, but you get the idea for this argument. (Shush you scientists.) If you were playing a sport that uses a ball, what would up or down mean on the ball? Not much. It’s a sphere. It’s the same no matter how you hold it. The same thing goes for earth. The Australians have maps that are flipped on their heads. Australia is no longer down under. It is up above. The south pole is at the top. And you know what that does to California when compared to New York? Yes, you get it. It’s now the Right Coast, which has marketing appeal, with it’s double meaning. Next year, I’ll be headed to Thrillerfest, in addition to Right Coast Crime and the Anthony Boucher Honorary World Mystery Convention, to hang out at the bar with other authors, launch another book, and hopefully be asked to be on a panel to discuss the rise of audiobooks, like I did this year at Bouchercon. Thrillerfest never roams. It stays in the hub of worldwide publishing, New York City. The home of the Big 5. But wait. You’ve heard that Amazon has it’s own publishing arm. And aren’t ebooks taking over? That, my friends, is a beast to slay on another day. It’s time I got back to writing Funeral Rights, my next installment of The CUBIK Conspiracy book series.